(FinalCall.com) – Family gatherings around massive feasts, excessive shopping sprees, and expressions of gratitude are the traditional things associated with Thanksgiving but a dark history of atrocities and exploitation imposed on Native Americans and enslaved Africans still remains hidden, indigenous activists say. 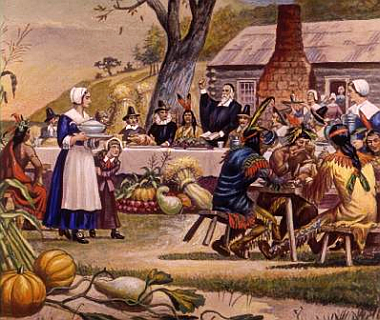 The Thanksgiving myth perpetuated each year is that Pilgrims, Puritans and others came to America in search of religious freedom, but these settlers actually forced others to join their religion, observed Marilyn Vann, president of the Descendants of the Five Civilized Tribes Association. “It is good for people to be thankful, meet with family and friends and worship God. But the Europeans’ society was not good for people of color and the reality historically is that when they came into power, they killed others and set up a society that enslaved people of color,” Mrs. Vann told The Final Call. Every year the United American Indians of New England mark a National Day of Mourning. Participants fast from sundown the day before through the afternoon on Thanksgiving to mourn their ancestors, genocide committed against their people, and theft of their land.